Rebecca Maynard is a leading expert in the design and conduct of randomized controlled trials in the areas of education and social policy. She has conducted influential methodological research, including co-developing PowerUP! to support efficient sample designs for causal inference studies, and she has been influential in advancing the application of research synthesis methods in education and social policy. She designed and directed the University’s Predoctoral Training Program in Interdisciplinary Methods for Field-based Education Research, which served more than 75 Ph.D. students from Arts and Sciences, Business, and Education between 2004 and 2016. From 2010 through 2012, she served as Commissioner of the National Center for Education Evaluation and Regional Assistance at the Institute of Education Sciences (IES), where she oversaw the Institute’s evaluation initiatives, the What Works Clearinghouse, the Regional Education Laboratories, and the National Library of Education. She is a Fellow of the American Education Research Association, an elected member of the Society for Research Synthesis Methodology, and recipient of the Peter H. Rossi Award for Contributions to the Theory and Practice of Program Evaluation (2009) and the Society for Research on Adolescence Social Policy Best Book Award for Kids Having Kids (1998). She also is past President of both the Association for Public Policy Analysis and Management (APPAM) and the Society for Research on Educational Effectiveness. Prior to joining the University of Pennsylvania faculty in 1993, she was Senior Vice President at Mathematica Policy Research, Inc.
Dr. Maynard has a varied portfolio of research projects, including roles as co-investigator for the Center for Research Use in Education and for an IES-funded evaluation of Year Up’s Professional Training Corps programs; co-PI for an IES-funded project of the Society for Research on Educational Effectiveness to develop a Registry of Causal Inference Research in Education; and as a member of the technical team for the What Works Clearinghouse Statistics, Website and Training (WWC-SWAT) project. In addition, she serves on numerous advisory boards and committees, including the advisory boards for Project Evident, Horizons National, the Western International School of Shanghai, and the Committee on Evidence-based Practices for Public Health Emergency Preparedness and Response at the National Academy of Sciences, Engineering, and Medicine. Dong, N., Kelcy, B., Spybrook, J., & Maynard, R. A. (2016). PowerUp! Moderator: A tool for calculating statistical power and minimum detectable effect size differences of the moderator effects in cluster randomized trials. [Software]. http://www.causalevaluation.org/. Dong, N., Kelcy, B., Spybrook, J., & Maynard, R. (2016). PowerUp! Mediator: A tool for calculating statistical power for causally-defined mediation in cluster randomized trials. [Software]. http://www.causalevaluation.org/. Dong, N., & Maynard, R. (2013). PowerUp! : Main Effects: A tool for calculating minimum detectable effect sizes and sample size requirements for experimental and quasi-experimental designs. [Software]. http://www.causalevaluation.org/. Maynard, R., Baelen, R., Fein, D., Shivji, A., & Souvanna, P. (2018, June 18). Improving learning & development completion: Experimenting with alternative strategies for monitoring & supporting academics in the PTC. Post-read for Year Up staff conversation. Bethesda, MD: Abt Associates. Maynard, R. (July 2018). The role of federal agencies in the design and administration of evidence-based policies. Annals of the American Academy of Political and Social Sciences, 678(1), 134–144. Maynard, R. (2018). The practice and promise of policy analysis and program evaluation to improve decision-making within the U.S. federal government. In J. Hird (Ed. ), Policy analysis in the United States. Bristol, UK: Policy Press at the University of Bristol, (pp. 93–112). Orr, L., & Maynard, R. (2015). Social experiments. In J. B. Wright (Ed. ), International encyclopedia of the social and behavioral sciences, 2nd ed. Amsterdam: Elsevier (pp. 291–300). Earle, J., Maynard, R., & Neild, R. (Joint Committee Co-Chairs). (2013). Common guidelines for education research and development. Washington, DC: Institute of Education Sciences & National Science Foundation. Hawkinson, L. E., Griffen, A., Dong, N., & Maynard, R. (2012). The relationship between child care subsidies and children’s cognitive development. Early Childhood Research Quarterly, 28(2), 388–404. DOI: http://dx.doi.org/10.1016/j.ecresq.2012.10.002. Metzger, C., Maynard, R., Vultaggio, J., Daizen, T., Promboon, S., Ip, K., Park, S. (2010). A comparative perspective on the secondary and post-secondary education systems in six nations: Hong Kong, Japan, Switzerland, South Korea, Thailand and the United States. Procedia - Social and Behavioral Sciences, 2(2), 1511–1519. DOI: 10.1016/j.sbspro.2010.03.227. Ritter, G., & Maynard, R. (2008). Using the right design to get the wrong answer? Results of a random assignment evaluation of a volunteer tutoring program. Journal of Children's Services, 3(2), 4–16. Hoffman, S., & Maynard, R. (co-editors & contributing authors). (2008). Kids having kids: Economic costs and social consequences of teenage pregnancy. Washington, DC: Urban Institute Press. Dong, N., Maynard, R., & Perez-Johnson, I. (2008). Averaging effect sizes within and across studies of interventions aimed at improving child outcomes. Child Development Perspectives, 2(3), 187–197. Maynard, R., & Hoffman, S. (2008). The costs of adolescent childbearing. In S. Hoffman & R. Maynard (Eds. 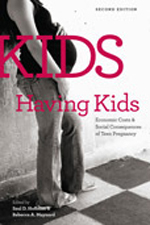 ), Kids having kids: Economic costs and social consequences of teen pregnancy. Washington, D.C.: Urban Institute Press (pp. 359–402). Herman, R., Dawson, P., Dee, T., Greene, J., Maynard, R., Redding, S., & Dawson, M. (2008). Turning around chronically low-performing schools: A Practice guide (NCEE #2008-4020). Washington, DC: U.S. Department of Education. Amato, P., & Maynard, R. (Fall 2007). Decreasing nonmarital births and increasing marriage to reduce poverty. The Future of Children, 17(2), 117–141. Herman, R., Boruch, R., Powel, R., & Maynard, R. (2007). Overcoming the challenge: A response to Alan Schoenfeld’s “What Doesn’t Work." American Education Research Journal, 35(2), 22–23. Perez-Johnson, I., & Maynard, R. (2007). The case for early targeted interventions to prevent academic failure. Peabody Journal of Education, 82(4), 589–616. Maynard, R., & Wilcox, B. (2007). Conducting field experiments of setting-level policies and practices. New York: William T. Grant Foundation Annual Report. Maynard, R. (2006). Presidential address: Evidence-based decision making: What will it take for the decision makers to care? Journal of Policy Analysis and Management, 25(2), 1–17. LaLonde, R., & Maynard, R. (1987). How precise are evaluations of employment and training programs? Evaluation Review, 11(4), 428–451. Fraker, T., & Maynard, R. (1987). The adequacy of comparison groups designs for evaluations of employment-related programs. Journal of Human Resources, 22(2), 194–227.